When you have just gone a full winter without your favorite MN Largest Candy Store fix, it can be rough. Don’t get me wrong, the candy store is only a stop I make on a whim a few times a year. But when someone tells you, you can’t have it, for some reason you want it more. It’s like when you are pregnant and they tell you all that eating cold lunch meat is dangerous. You may not have eaten them very much turkey before but now it’s all you can think about. It’s that way with the Candy Store for me. But I just found the next best thing, the Blue Sun Soda & Sweets Shop. After one polar vortex and a winter filled with more snow days that I’ve ever seen, I was over being stuck in the house. What I needed more than anything was to get out on the road again. This time the family and I headed north to the Blue Sun Soda & Sweets Shop. 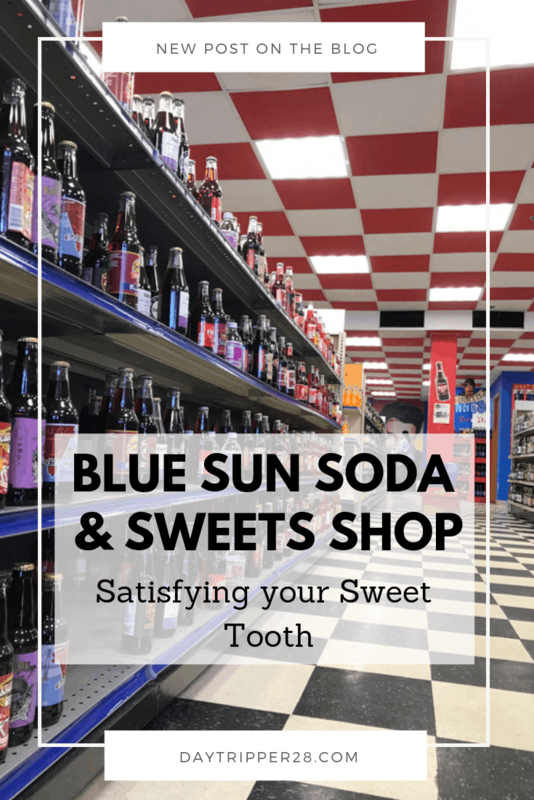 The staff spotted us right when we walked in and realized we were first-time visitors, giving us the rundown of everything Blue Sun Soda & Sweets Shop had to offer. Things like Free Popcorn, Ice cream floats and the ability to instantly chill a bottle of soda in under a minute were just a few of the features. They carry over 1300 different flavors. They did the math, if they drank one soda each of their shifts, it would take them 5 years to try every single variety. Our heads were spinning. I, on the other hand, was looking at all the glass and thinking about how much damage my youngest could do if he was let loose on the store. My husband and I each took a kid and started to explore the isles. The sodas are divided up by flavors, making it a little easier for us to absorb just what we were looking at. My kids were swayed by colors, and less on the flavors. Instead of having all the soda’s marked individually, everything was priced by quantity, making it easy to walk out with 12 different varieties. We let both kids pick out a couple and we rounded out the varieties to make it a dozen. It averages out to be about $2 – $2.50 per bottle depending on the quantity. Fruity Pebble, Watermelon, Root Beer, Blue Cherry, and Shirley Temple are some of my favorites that made it into our basket. With so many options, it’s hard to remember what you drank and what to buy again. Don’t worry, Blue Sun Soda and Sweet Shop thought of that. They created a soda tracker for you. This way you’ll know that Watermelon flavored soda was more of a fruity punch flavor than watermelon. Or that Friday Pebbles is cavity-inducing. I’m kind of a gambler when it comes to soda. With over 84 different brands to choose from, it was a little overwhelming. But what I absolutely loved was knowing that two of their brands, the Whistler Classic Soda and North Star Craft Soda were bottled on site. Even better, you can view the whole operation on one of their tours. Tours are available by request, so no need to be there on a specific day. Cost $5 a person with a 10-person minimum and each tour ends with a bottle of Whistlers Classic Soda. I didn’t have a group that large, but that didn’t stop us from taking a quick peek at the bottling operation. One peak and you’ll know that retro is making a comeback! We were hoping for some of the Largest Candy Stores grandeur. They pride themselves on Soda which is probably was a good thing for my waistline. Thankfully, they had a lot of the key old school favorites, like candy cigarettes, Charleston Chews, Pez and saltwater taffy. It’s enough to make you think you’ve gone back in time. Come to think of it, I don’t recall seeing any of the candies you see on the shelf of target’s checkout counters. Maybe it was just that I don’t want the ordinary. 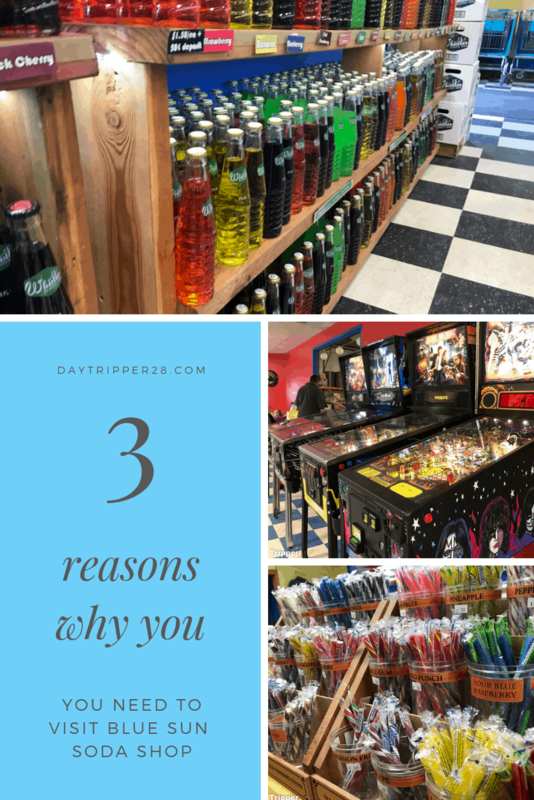 Don’t forget about the collection of retro pinball machines of every kind. Each machine costs a quarter a piece. You don’t need to run through your house looking for every spare quarter you can find like I did. Bring a few bills because they have a change machine. Not only was their pinball, but Ski Ball too. It was arcade fun at its finest without the craziness and high costs of the Chucky Cheeses and Dave and Busters of the world. Like with any place Blue Sun Soda and Sweets has some of their own fun things to watch out for. Thankfully, you won’t find anything on here like, CASH ONLY. Visa, MasterCard, and Amex were all excepted. When the weather is nice, during the Spring and to Late Summer, Food Truck like to hang out making a great place to hang out at. They attract all kinds and have a scheduled posted online. If you are concerned about your little ones running around in a room filled with glass bottles, give them a free bag of popcorn to keep their hands occupied. They have a room you can reserve for different events or parties. Buy a bunch of bottles and have some fun at the arcade. Throughout the year they host different in-store events. This past weekend we were there for St. Patrick’s Day and anyone wearing green got a special treat. Plus there was free Ice Cream Floats with any soda purchase. Follow them on Facebook to get the full details. They are open year around 10-8 Monday – Saturday and 10-6pm on Sundays. 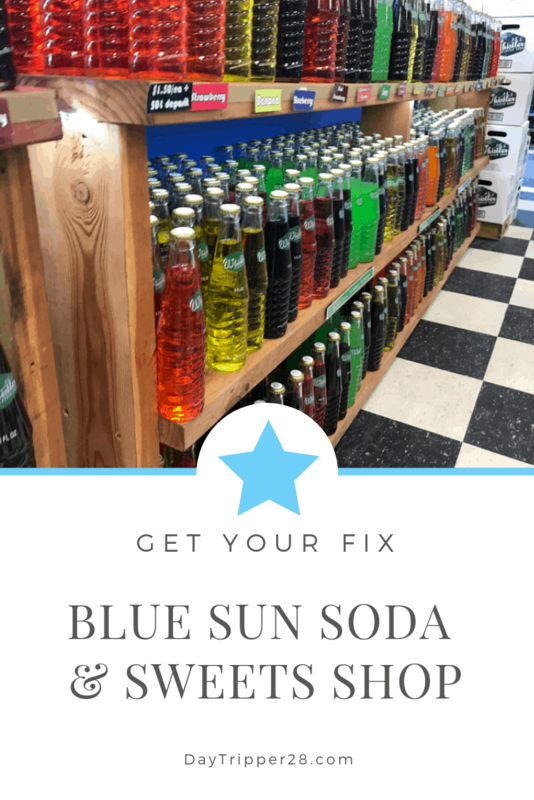 The Blue Sun Soda & Sweets Shop is located in Spring Lake Park, just north of Mounds View. This is one of the closest old fashion soda shops near Minneapolis. If you are looking for a quick escape from the average trips, need a quick pick me up on your next road trip north, or are just looking to spoil your kids, this is one stop you won’t forget. I’ve been saving that last bottle of soda in the back of my fridge for a little while now, hoping to keep the memory of my trip going for a little longer. What a fun stop! I love following along with your cool local finds!